New TENA Complete™ with innovative DuoLock™ Core Technology – Setting the new standard for quality and cost. 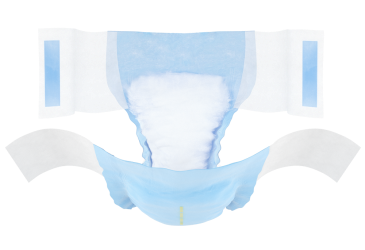 TENA’s patent-pending two core technology DuoLock™ is unique as it allows for even distribution of Super Absorbent Polymer (SAP) and pulp for an even and thinner large core. The smaller core under big core design acts as a reservoir to wick away and lock in moisture; helping to keep skin drier and wearer more comfortable. The advanced technology helps provide better incontinence care as its higher SAP concentration in the small core for improved absorption capacity where it matters most. Keep your residents comfortable and dry with TENA Complete™ while staying within your budget. Patent-pending two core system with absorption capacity where it matters most wicks away and locks in moisture to help prevent leakages. Two-tab fastening system makes product application more comfortable for residents while providing a proper fit to ensure leakage protection. There is no need to open the product to find out if it needs changing. The wetness indicator on the outside turns from yellow to blue to show when it needs to be changed. All sizes meet the National Association for Continence (NAFC) standard requirements.